Between January 16 and 19, 2019, Eurosonic Noorderslag will host the largest showcase of contemporary Czech and Slovak music abroad. 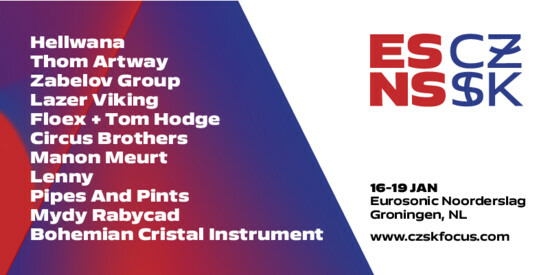 The Czech Republic will be represented by Bohemian Crystal Instrument, Circus Brothers, Floex & Tom Hodge, Lazer Viking, Lenny, Manon Meurt, Mydy Rabycad, Pipes And Pints, Thom Artway, Zabelov Group and Hellwana, who wes selected by the export project of Radio Wave, Czeching. Eurosonic Noorderslag is the most prestigious European music showcase festival and conference that each year presents a selection of the European music scene. The showcase includes 350 concerts, a rich conference program, attendance of around 40,000 visitors, including 4000 music professionals from around the world. Due to the growing interest of the music industry in the Central European space, the anniversary of the foundation of Czechoslovakia and the activity of the Czech music export office, SoundCzech, the organizers decided to organize the first dual focus in the history of Eurosonic Noorderslag, connecting yet again Czechia and Slovakia together. “Visitors can look forward not only to eleven Czech bands but also some panel discussions with Czech professionals, networking meetings, a Czech-Slovak lounge or printed guide to the Czech and Slovak music scene created in cooperation with the Full Moon Magazine. The anniversary of the foundation of Czechoslovakia and its history will be presented through a special video-mapping on the Groningen museum building,” Márton Náray, director of the export office, SoundCzech, (in cooperation with the Slovak Pohoda festival the partner organizer of the focus) summarizes the program. Slovakia will be represented by Autumnist, B-complex, Katarína Máliková & Ensemble, Isama Zing, Möbius, Nvmeri, Our Stories, The Ills, Thisnis a Tittingur. The Czech-Slovak focus was financially supported by the export office, SoundCzech, established by the Art and Theatre Institute, the funded organization of the Ministry of Culture, CR, Ochranný svaz autorský (OSA) and Svaz autorů a interpretů.